An information session on Halifax FC plans takes place March 30. Think of it as a free kick. Halifax can test out an open-air stadium in the shadow of Citadel Hill without spending anything more than the price of admission. Sports and Entertainment Atlantic president Derek Martin pitched the idea to councillors on Thursday for a pop-up stadium at the Wanderers Grounds, between the Public Gardens and the Museum of Natural History. Current plans call for an easy-to-assemble facility with two large bleachers seating 5,000 to 6,000 people. Martin says it may even have a beer garden for refreshments. The stadium would be home turf for a still-tentative professional soccer team—unofficially being called supported by the Halifax Wanderers fan group—in the proposed Canadian Premier League. The company is targeting 3,000 season ticket holders, with single ticket prices ranging from $10 to $35. While it’s too early for him to discuss financials, Martin told reporters the combined costs for a team and stadium would run between $3 to $4 million, and will be financed by private investors. The company isn’t asking for funding from HRM, and SAE will assume all installation and management costs. The three-year lifespan of the temporary facility allows the city to try on a stadium and see how it fits, before committing to anything permanent. Councillors on the community planning and economic development committee were optimistic about the smaller-sized stadium. Lower Sackville’s Steve Craig called it the “sweet spot” missing from previous stadium discussions. Dartmouth Centre’s Sam Austin agreed, saying too often in talking about a stadium HRM foolishly compares itself to successful football teams in smaller markets like Green Bay, Wisconsin or Regina, Saskatchewan. Martin says SAE is working with three companies on the design of the snap-together stadium, one of whom also helped create the 6,000-seat desert stadium that opens this week in Phoenix, Arizona. When there’s no league match being played, other local high school and university teams would be able to rent the facility for use at a nominal cost. 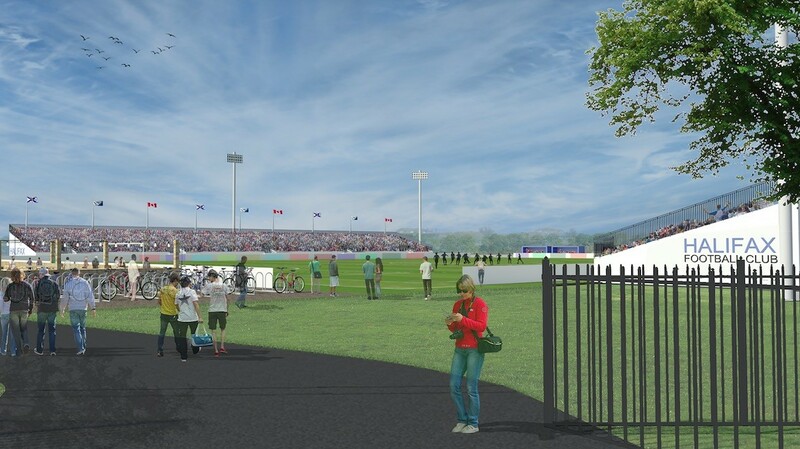 Sports and Entertainment Atlantic previously helped organize last year’s Canada/Scotland rugby match, which was supposed to take place on the Wanderers Grounds before the poor condition of the site forced the event to move to Spryfield. A tender to improve the turf, irrigation and fencing at the Wanderers has already been issued by HRM and work to repair that damage will happen over the summer. The timeline proposed by SAE says a team could be announced as early as May, with stadium installation beginning in July and test events held in September. The inaugural Halifax professional soccer season would take place next summer, just after the 2018 FIFA World Cup. The CPED committee will put forward a motion asking for a staff report on the idea at its next meeting in two weeks. Recommendations from that report will still need to be debated at the committee level and by Regional Council before the SEA gets its goal. The whole spectrum of athletic endeavours—from solo sports to team takedowns—awaits enthusiastic spectators this summer. And if you’re not so into screaming from the sidelines, there’s room for some players, too.